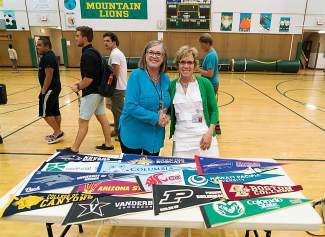 IMS Site Admin Sharon Kennedy, left, and IHS K-12 Admin Leslie Hermann stand in front of all the college pennants on June 9. Check out the Incline High School Boosters Facebook page at facebook.com/InclineHSBoosters to many photos from the June 9 event, as well as images from the annual Baccalaureate service on June 12 at St. Francis of Assisi Catholic Church for the IHS Class of 2016. And don’t forget: The 2016 Incline High School graduation ceremony is set for 4-6 p.m. Thursday, June 16, at the IHS gym. Visit inclinehs.org to learn more. INCLINE VILLAGE, Nev. — On June 9, a group of Incline High School seniors met with Incline Middle School eighth-graders to give them a bit of advice about high school, and to present IMS Site Administrator Sharon M Kennedy with a pennant representing the college each senior would be attending in the fall. These pennants will hang at the middle school wall as an inspiration to current and future IMS students. All the high school seniors encouraged the eighth-graders to pay attention to their academics. 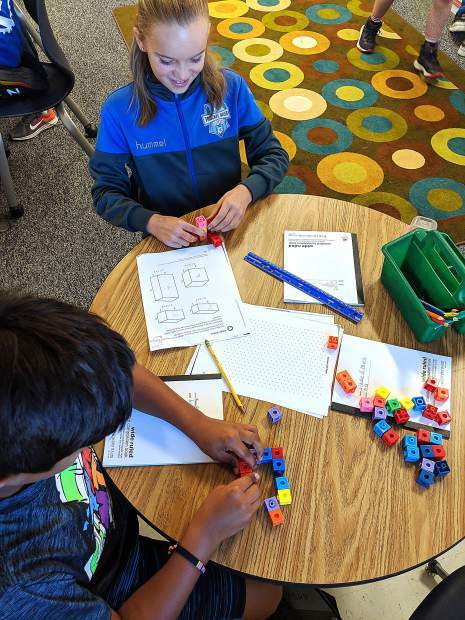 Stephanie Homola (Arizona State University) told the eighth-graders not to wait until first period to do their homework, but to do their homework at home on a daily basis. Anne Schrage (Boston College) advised students not to procrastinate and shared advice from two students who sent in their pennants but could not attend the celebration. Outside the classroom, Grant Goldenberg (Washington State) said to join some clubs, play sports and show a lot of school spirit. Brianna Barazza (College of the Canyons) told eighth-graders to be themselves, and lastly, Ryan Eppolito (Columbia), shared that the future high scholar’s experience would be all about their attitude. It is up to them to create their best high school experience. After the presentation, the seniors took questions from the eighth-graders, ranging from navigating friendships in high school to participating in AVID (Advancement Via Individual Determination). The seniors were also able to donate funds to the new Incline Middle School Technology fund.